Home Uncategorized Healing Elevated Conference 2019! Flyer description: The top part of the flyer shows two hands of a white female holding one hand of a white male, with a wood background. The bottom half is divided in two green boxes with white font. Left green box reads: Saturday, May 4, 2019 9am to 2pm. Sanderson Community Center for the Deaf and Hard of Hearing 5709 S. 1500 W. Taylorsville, UT. Free admission! The second box reads: Workshop topics: LGBTQ panel, holistic healing tools, Self care activities anymore! Please RSVP: info@slcad.org by April 26th! Booth registration: Erin@slcad.org. in italics: *accommodations will be provided upon request. Sego Lily is excited to announce the second “elevated” mini conference taking place this year! 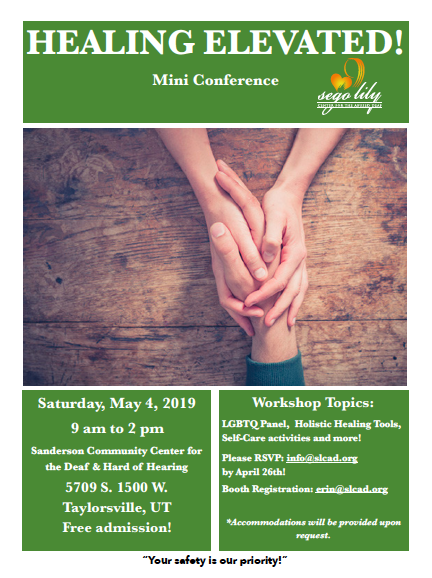 The “Healing Elevated” mini conference will take place Saturday, May 4th from 9-2pm at the Sanderson Community Center for the Deaf and Hard of Hearing. We have chosen the theme “Healing Elevated” because we are in Utah (Life Elevated) and we have all experienced trauma on different levels. We have amazing presenters lined up! Deaf therapist, Deaf Reiki Master, Deaf Life Coach, Deaf LGBTQ leaders, and more! Workshop topics: Healing through Reiki, healing through expressive body movement, Self Care, LGBTQ Panel and discovering your true nature! We will provide interpreters for those who do not sign. All workshops will be in ASL.